Sports are a great way for children to exercise and learn teamwork, and all kids love playing games. Capture the both of both worlds with the Sports Fun Activity Pad. Whether the youths in your life enjoy baseball, football, basketball, hockey, soccer or more, this pad has you covered. Featuring a full color cover plus 16 pages of games and activities, this pad contains hours of fun for the young sports enthusiast. Recommended for children ages 3 and up. Imprinted with your message. Excellent salesperson leave-behind product. This product is also ideal for youth sport organizations. Size: 5 1/4 " x 7 3/4 "
Price Includes:1 color imprint on activity pad in standard imprint color. 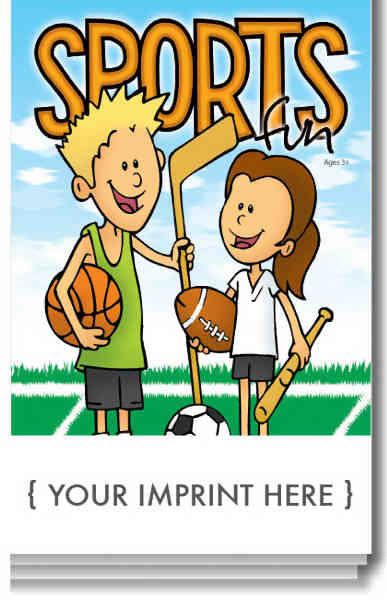 Imprint Colors- Other colors may be available depending on quantity, please call prior to ordering. Imprint Colors- Other colors may be available depending on quantity please call prior to ordering.